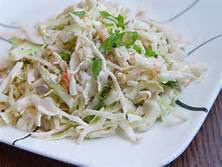 Coleslaw is still a favorite today because of its unique flavor and texture. However, since it’s usually enjoyed raw, I recommend using only organically grown vegetables that are not sprayed with pesticides and other toxic chemicals. This Fresh and Crunchy Coleslaw Recipe uses only wholesome ingredients that blend so well together, and is sure to please everyone — even picky eaters. In a large bowl, combine mayonnaise, apple cider vinegar, garlic powder, celery seed and salt. Whisk together until all ingredients are fully incorporated. Add the shredded cabbage, celery, carrots and finely chopped green onion. Mix very well to coat evenly.